Welcome to the BetNHL.ca Hockey Blog. This section is generally a mish-mash of random articles covering hockey. We usually write here during the off-season or if there is a break for say the Olympics. Sometimes on a day with no tips we will write an article. All of the articles are filtered by category. This will allow you to look for the content you’re interested in easier. If there are any topics you want us to cover or if you have any suggestions for off-season contact, contact us. 5 Tips for New Sports Betters: In this article I cover 5 tips for new sports betters – people who are betting sports for the first time. Covers a lot of basics such as tracking your bets, the fact that you’ll lose and leaving emotion out of it. NHL Betting Bankroll Management: We wrote an article covering bankroll management and suggestions for how to bet the NHL. It was very popular and we wrote a Bankroll Management: Follow Up article a few weeks later. Psychology in Sports Betting: An article covering the psychology in NHL games and how it can affect the way you bet. It goes into detail about one particular game. 5 Strategy Tips for Daily Fantasy Hockey: Daily Fantasy Hockey has really taken off in a big way. In this article we covered 5 basic strategy tips for winning in daily fantasy hockey. Winter Olympics Simulated on NHL 94: We spent hours upon hours upon hours setting up all the rosters correctly on NHL 94 for the Sega Genesis for the Winter Olympics, then simulated it to see how they’d turn out. Holy crap that took foever. NEVER AGAIN. Stanley Cup 2016 Odds Retrospect: A look back at the betting odds prior to the 2015/2016 season to win the Stanley Cup and then how things actually panned out. 5 Epic 2014/2015 Moments: A look back at 5 epic moments throughout the 2014/2015 season. Featuring the incredible Tarasenko goal. 5 Memorable 2015/2106 Moments: A look back at the 2015/2016 season and the memorable moments. #1? Why John Scott of course. What Team Will Ovechkin Do Best On? : In this article, we put Ovechkin on every team in the NHL in the XBox game NHL 14 and then simulated it to see who he would do best on. There was an additional part two and part three. Stamkos & Subban on the Leafs: There was a lot of rumours in 2014 about Stamkos joining the Leafs. It didn’t happen but we simulated it to see how they’d do and we also added PK Subban as well. Boy did they do well with Stamkos. NHL 14/15 Opening Games: We simulated the opening 4 games of the NHL 2014/2015 season on NHL 15 for XBox. The amazing thing? It got all 4 correct! Bodog Divisional Dynasty: In 2013 the online sportsbook Bodog did a really cool promotion called Divisional Dynasty. Basically you had to place a bet on every single NHL team over the course of 30 days. If you did this you would get a bunch of free promos. It was a hell of a lot of fun. Betting Exchanges: In this article we covered what exactly betting exchanges were and how they worked – particularly in regard to hockey. Canada Deposit Options: This was an article written in 2014 aimed at Canadians – covering what online sportsbooks you could deposit at and how to deposit. $20 Guaranteed Winner Bet: This is the details of an exclusive promotion we set up with the online sportsbook Sports Interaction. It’s still going today! Canadians only though. 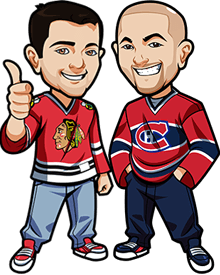 Talking the Stanley Cup Finals 2015: We sat down with the online sportsbook Sports Interaction to discuss the 2015 Stanley Cup Finals and the betting action involved in it. After the season was over, we sat down with Sports Interaction again. Note that the below fantasy hockey articles were written in 2013. These were NOT to do with daily fantasy hockey. Top Fantasy Hockey Centers (2013): Analysis of the Top Centers in Fantasy Hockey featuring Sidney Crosby, Steven Stamkos, Evgeni Malkin, Claude Giroux and John Tavares. Top Fantasy Defenders (2013): Analysis of the top fantasy hockey defenseman such as P.K. Subban and Kris Letang. We look through any potential sleeper picks. Top Fantasy Goalies (2013): A look at the top ranked goalies of the 2013/2014 season. Crazy to think Carey Price was ranked 7th at the time by the majority of the sites. Boy how things have changed. Top Fantasy Left Wingers (2013): A look at the best left wingers in 2013 in fantasy sports. Featuring the likes of Daniel Sedin and Bobby Ryan. Top Fantasy Right Wingers (2013): A look at the top 5 right wingers in 2013. Ovechkin and Kane were the two at the top of our list. I know – shocker. 2014 Winter Olympics Contest: We ran a site contest covering the Winter Olympics. You had to create a “team” from all of the players participating then you’d get ranked based on how they did. Betting Action During the Summer: Even though the NHL season is over the betting doesn’t have to end. In this article we go over your betting options during the Summer of 2016. December Dynasty: We ran a contest called the BetNHL.ca December Dynasty in 2013 where all members of the site got to participate in a contest where they had to pick every NHL team over the course of December to win a game. It was very fun! That was in 2013 and it was so popular we also did a December Dynasty 2014 contest. Here’s an update for it. 2015/2016 Season Summary: Another successful betting season and we covered the season in detail as well as previewed the upcoming off-season. 2015 Summer Plans: we wrote about what we were planning to cover throughout the Summer at BetNHL.ca. 2014/2015 Regular Season Summary: As the NHL regular season ended we wrote up a season summary of how we did betting wise. 2014/2015 Season Summary: Post-playoffs, a season summary of how we did in the playoffs. 2013/2014 Season Summary: An article covering how we did during the 2013/2014 season both from a betting perspective and a traffic perspective. 2013/2014 BetNHL.ca State of Address: We wrote this article prior to the 2013/2014 NHL season to cover the purpose of the site and talk about our expansion of it. 2013/2014 was the 2nd season we were providing NHL Tips and there was a lot to update due to the popularity of the site so we covered it there.